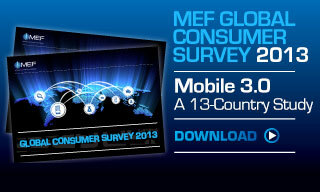 London, 5th December 2013 – MEF, the Global Community for Mobile Content and Commerce today announced the results of its annual Global Consumer Survey. The report reveals the behaviour and attitudes of mobile media users from across the globe in developed and growth markets, giving unprecedented data and intelligence in to consumer engagement via mobile in 13-countries. Carried out in partnership with On Device Research, the expanded annual study which this year includes Kenya, Nigeria and UAE for the first time analyses data from 10,000 consumers. It reveals that 65 per cent of mobile media users globally have used their device to purchase goods or services. Digital goods, spurred by the growth in freemium business models and in-app purchases still dominate this area of mobile content and commerce. However the research reveals a decline in the volume of purchases for the first time – from 54 per cent of mobile media users in 2012 to 42 per cent in 2013. Globally, there is a growing trend towards purchasing physical and perishable goods with 25 per cent of users globally happy to shop on mobile for these items. The study also found that the number of actual purchases may be falling in volume, but the value of individual purchases is going up. High spend purchases (over $151 or equivalent) jumped to 39 per cent with low spend items (under $15.99 or equivalent) at 37 per cent dropping from 43 per cent in 2012. ‘High spenders’ are most prolific in Nigeria, Mexico and Kenya reflecting the mobile-first ecosystems in these regions. The comprehensive study, now in its third year, analyses both developed and growth markets namely Brazil, China, India, Indonesia, Kenya, Kingdom of Saudi Arabia, Mexico, Qatar, South Africa, UAE, UK and US. It identifies a discernable shift in the purchasing of digital goods as consumers embrace an era of Mobile 3.0. This is characterised by a new breed of super apps that are displacing one off purchases – for music or video for example – with longer term subscription based services or apps and games offering months of immersive gameplay, typifying in-app purchase business models and long term player engagement. This is not limited to developed markets; the report found a significant number of consumers in growth market regions are moving past the premium content phase and into a space defined by smartphones and apps. However, Consumer Trust remains a significant barrier to increased adoption and purchasing behaviour and is a growing concern for consumers. In the 2013 Global Consumer Survey, 40 per cent of consumers cite Trust as an issue compared with 35 per cent in 2012 and 27 per cent in 2011. Next PostWhat’s the Deal with Adware on Android?